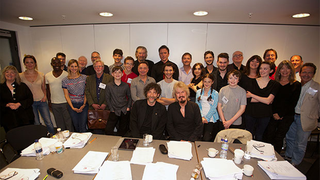 Along with the announcement that the first ever Good Omens adaptation would be a December radio play came this photo of the cast. Who do you recognize? The audio drama, which begins recording today in a secret London location, has a cast including Colin Morgan (Merlin, The Fall) as Newton Pulsifer, Josie Lawrence (Skins, EastEnders) as Agnes Nutter and Paterson Joseph (Peep Show, Green Wing) as Famine, as well as a host of delightful cameos, from the Gardeners' Question Time team to Neil and Terry themselves. Other cameos are set to delight listeners, but they are under wraps for now. Probably in a dusty occult bookshop in Covent Garden, but no-one is quite sure. Mark Heap (Spaced, Green Wing, Stardust) and Peter Serafinowicz (Guardians of the Galaxy, Star Wars: The Phantom Menace, Shaun of the Dead) will be taking the central roles as angel and demon, Aziraphale and Crowley, respectively. The star-studded cast will also include Clive Russell (Game of Thrones, Ripper Street), Julia Deakin (Spaced, Hot Fuzz), Louise Brealey (BBC's Sherlock), Simon Jones (Hitchhiker's Guide to the Galaxy), Arsher Ali (Four Lions, Complicit, Beaver Falls), Phil Davis (Silk, Whitechapel, Being Human) and Mark Benton (Waterloo Road, Land Girls) to name but a few. There are only a few confirmed roles there and there are new faces in the photo. Some are obvious (The kids are clearly the Them, right?) and others aren't. We still don't know who's playing Shadwell, Madam Tracy, Hastur, Ligur, Death, War, or Pollution, for example.